When operating an organization such as a church where the main component to success is the people, it is beneficial to keep the members listed in one location for easy and quick access. Using the Microsoft Word Church Directory Template will allow for any and all information concerning the parishioners of the church to be recorded in one place using this free template that can be downloaded right from this page. This template will organize information which will leave more time for prayer instead of paperwork. Keeping customized records will help the secretaries to organize, view, or find the needed information both quickly and efficiently. 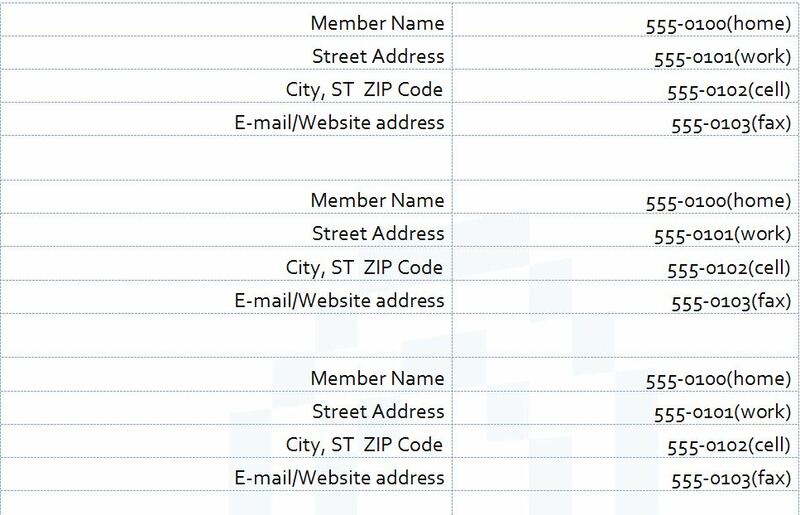 This template can organize names, addresses, telephone numbers, and any other pertinent member information. This directory is an excellent way to keep all important information organized and easily accessible. Download this directory template from this page and fill in the organization data necessary. Save this information to a file on your computer. Compile the organizations data for each church member and list it on the simple directory template form. This may involve information such as name, address, or length of membership. Print copies from the church directory template. It is necessary to keep accurate paper copies as well as a file on the computer. When information is repetitious, the site allows to save a blank page from the free download template, and then save each document to a separate file. Assemble all of these files into one main folder. Customize any portion of the original template that will not be updated regularly, eliminating the need to re-type in the information. After completing all of the recording of the data on to the free downloadable church directory template, print out paper copies to keep records of the information for instances of safety or other possible legal instances. When using the free church directory template, all information regarding church members can be organized, arranged, customized, and located easily and quickly.